The New York Times is dedicated to providing news coverage of exceptional depth and breadth, as well as opinion that is thoughtful and stimulating. Widely quoted, and often hotly debated, The New York Times is held by its readers to the highest of standards and continues to be regarded by many as the nation's pre-eminent newspaper. The New York Times has earned an unprecedented 94 Pulitzer Prizes, far more than any other newspaper. A global news staff covers a wide range of interests: from world, national and New York issues to business, culture, science, religion, travel, style, food, sports, health and home. In addition to outside contributors, the editorials page features The New York Times' own team of award-winning columnists: David Brooks, Maureen Dowd, Thomas L. Friedman, Bob Herbert, Nicholas D. Kristof, Paul Krugman, Frank Rich and John Tierney. The Kindle Edition of The New York Times contains articles found in the print edition, but will not include some images and tables. Also, some features such as the crossword puzzle, box scores and classifieds are not currently available. For your convenience, issues are automatically delivered wirelessly to your Kindle so you can read them each morning. I've been getting the NYT on the Kindle for several months. It is formatted well for the Kindle. I overlooked the many Liberal editorials because of the Kindle experience. But, today was the last straw. 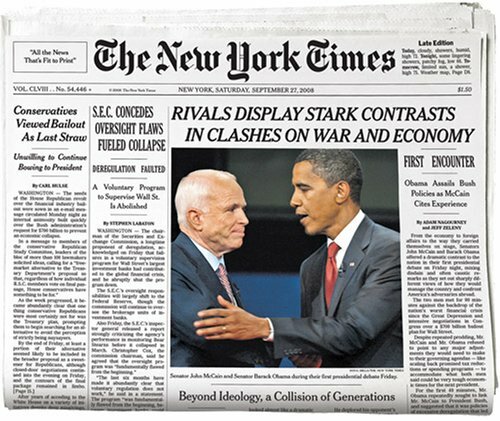 A very negative slant about Mrs. McCain on the FRONT PAGE. If you wamt to put this trash in an editorial fine, but, to disguise this trash as news.....not for me. I decided to give The New York Times another go, having forgot why I stopped reading it in the first place. After reading the NYT in its paper format for over 35 years, and for several years online via the computer, I wasn't sure how I would like it via the Kindle. After a month reading it on my Kindle, I will never go back to paper. Two reasons. First, in every location where I read the paper, the Kindle is the most user-friendly medium. On the subway: As a subway commuter in Washington it was common that the cars were so packed that I could not even turn the page of the paper version. So, I would stand for 30 minutes looking at the front page. Not a problem on the Kindle. At home: whatever position (laying down, standing up, getting dinner ready, etc.) holding and reading the Kindle is always comfortable. Second, while I always seemed to miss an article in the paper format, I never do with the Kindle version - - all the articles are listed. The key (and maybe this should have been obvious if I had read the Kindle user guide) is to start with "Go to Articles List" and then use the "Back" button to quickly get back to the articles list after you are done reading the current article. No more missing that article hiding on the bottom of the page in the middle of the section. I also subscribe to the update service, which is a great companion to this subscription. I was very surprised and disappointed to learn recently that my Kindle edition of The New York Times was missing editorial opinion pieces. The most recent example is an op ed article by Roger Cohen which appeared in the print edition on April 20, 2009 but was not included in my Kindle edition. The only reason I know this is because a friend sent me an email with comments on the article, which of course I hadn't read. I have known for the 16 months that I have been subscribing to the Times on the Kindle that I have not been getting things like the weather tables, sports scores and standings, and the crossword puzzle, and although I don't understand why you don't provide that information, since you do provide pictures and other images, at least you warned me about it when I subscribed. But random missing content is very disquieting, particularly since I don't know what else I am missing. Kindle should either tell its subscribers specifically what content is not included, or, preferably, Kindle should fix the problem. Purchased a Kindle2 and subscribed to the NY Times. One goal was to avoid the 1/4 mile walk to the mailbox to get the paper, another was to get rid of the piles of old newspapers which also have to be hauled 1/4 mile to be recycled. Key to this was getting a REAL NY Times electronically. the Kindle2...and the paper is on my device when I wake up in the morning. However, very valuable sections are missing. For example, on Friday's paper the Broadway theatre listing was missing, while the classical and dance sections were there. These weekend activities are an important poart of the Times value to subscribers (at least in the NY area) and need to be included. A few more photos would be nice too : the real estate and weddings sections have none. Both of these are cases where a photo adds value to the story. With just a little more work, it would be a great substiture for the hardcopy paper. Missing the classifieds, ads, travel section etc. makes the NY Times for kindle a bit worthless. I still have to buy the Sunday edition to get the "relaxing" parts of the paper that make it special. I do enjoy reading the Times on my Kindle. It is a little expensive but it's my one major indulgence, Kindle-wise. The content is usually fairly well formatted for the Kindle, with occasional exceptions. The graphics are rendered in greyscale and usually you can see basically what's going on there. I always go by the "Articles List", and I appreciate having summaries of each article there. I wish that some more of the online-only content would be included (but I guess they sell their blogs separately, for Kindle subscriptions). And a few sections are uninteresting to me (Sports, etc.) so I wish I could "skip this section" while still in the "Articles List" (you can skip a section but only in the "Sections List", except then you lose your place in the "Articles list"). I am disappointed with the abbreviated content. It killed me when the Seattle PI closed. I love the NYT too, but where we live we can't get daily delivery that's reliable (USPS). I bought my Kindle 2 thinking that for $14 I would be getting the whole NYT. Not true. I'm just a couple of days into my trial subscription and it's just a shell of a paper. Someone asked how I liked it. I told them it was the TV version of a newspaper. They show you what they think you want to read. One of the things I like about a print newspaper is that you may not want to read everything, but at least you have a choice. I'm going to cancel this trial and try the WSJ. But, I dislike their opinions about as much as I dislike the Seattle Times. Missing more articles than advertised. GOOD-BYE WSJ, and HELLO FT! I have just bought my Kindle 2, partially to get the WSJ subscription. I used to subscribe to the paper edition, but despite of only living from 10 miles of NYC delivery of the paper was terrible. I was impressed with my Kindle reader and I thought paying 9.99 for the WSJ was a good compromise. Although the navigation was a little bit cumbersome, I have found most of the content, and the whispernet delivery was great. As I just started my trial subscription I have found out that the price went up by 50%. I am hugely disappointed, and as soon as my 2-weeks trial is over I will be canceling my subscription. Although I have loved the WSJ, this price just does not make sense. So GOOD-BYE WSJ, and HELLO FT! I am disappointed with Amazon too, the pricing structure of its products just seem to be too unpredictable. There's no doubt that this technology isn't quite there yet. The Kindle itself is a remarkable product (especially for a first generation technology), but it's designed for books. The Times isn't as easy to navigate on a Kindle as a book, but the lower cost, lack of waste, and ease of delivery more than make up for it's relatively trivial shortcomings. Up until now, I had a weekend subscription and would read online during the week. The Kindle offers a nice compromise between the two. You get the readability of the physical paper without the waste, and greater convenience than the online edition. I find myself reading more of the paper every day and it's great to be able to reach over and read it without ever getting out of bed. The only real drag is the lack of updates throughout the day, which would be nice considering the price of the Times is substantially more than Kindle editions of comparable papers. The electronic format NYT has several disadvantages. First, the font seems to use less pixels then other newspapers so the text is a bit more difficult to discern and read at all font sizes. Second, as another reviewer mentioned, the left justified format with ragged edges is cumbersome when compared to a fully justified electronic newspaper. Third, there is a full blank line inserted between each paragraph which sacrifices space without improving readability. Finally, the Washington Post provides a word count for each article which is a nice way of letting you know how large of an article you are diving into, sort of like you would gather from looking at the size of an article on a printed page. no paper or ink - great idea! I didn't purchase the Kindle 1 because of its poor reviews for reading newspapers. I expected this would be fixed in version 2, and I'm delighted to say it was. Therefore, although I've subscribed to daily delivery of the NYT for more than 40 years, I canceled my paper subscription and subscribed on my Kindle. I have been paying $13.40 per week or $696.80 a year. With the Kindle, I am now paying $167.88 a year. Therefore, even in Year 1, after spending over $400 with the cover and extended warranty for the Kindle, I will be saving more than $100 and over $500 each subsequent year. * You get to finish the front page and all other stories that are continued elsewhere without having to turn to page X and then back to the front page. ( I've generally read the FP articles I was interested in and then turned through the rest of the first section, picking up the articles as I went through the section). How many times have you not finished an article because you didn't have time to go through the paper? * YOU CAN ADJUST THE FONT. For me and other older, visually challenged readers, that's a huge plus. * Just as a blackberry enables me to keep all of my contact and schedule data in one place, the kindle does the same for the majority of what I will be reading. * With the ability to turn a page with the touch of a finger, easier to eat while reading. Furthermore, if you like to read the paper in bed while your spouse is sleeping, there is no noise from page turning. * It's slightly heavier than I would prefer but the size is perfect. * The web access feature is experimental and did not work when I tried a simple search using google. * You can't email an article directly from the kindle. You have to download clipping to your computer with usb cable. It's not perfect, but it's a better reading experience than the paper version and, if you're a NYT subscriber a money saver as well. * You get to finish the front page and all other stories that are continued elsewhere without having to turn to page X and then back to the front page. ( I've generally read the FP articles I was interested in and then turned through the rest of the first section, picking up the articles as I went through the section). How many times have you not finished an article because you didn't have time to go thorough the paper? Love The Times, but they really don't get it. 1. The price is insane! You could read almost the entire paper online for free. It makes no sense to pay $14 a month for this. 2. Other newspapers on Kindle are way cheaper. Yes, the Times is the best (if you are into their viewpoint of course), but not worth paying a 5-8 dollar premium. 3. The free, online version is constantly updated. The New York Times is stagnant as soon as it is delivered each day to the Kindle. There are no updates. This may be a constraint of the Kindle newspaper delivery set up, but in any event, it's a drag. 4. Even the print version can be gotten for cheaper. My wife is a teacher. There are discounts for subscribing to the print version. The Kindle price is a flat rate (this is probably a limitation that Amazon imposes). 5. As others pointed out, the crossword is not included. I don't care at all, but it's worth noting for those of you crossword junkies. I love my Kindle 2 for books, blogs, and magazines. However, newspapers are a challenge. Obviously, it would be nice to have quick access to news of the day as well as detailed articles, as you can get from a computer's internet access. I have tried the New York Times for this service. However, I canceled my subscription after two months. It is incredibly expensive ($13.99 a month) especially for something you can get free online. In addition, you can't scan sections easily, such as you would do with a real paper (view front page section stories). Regarding options, I do subscribe to the WSJ which does have a way to scan the important non-business stories of the day, just like their front page right hand column. However, it is just once a day with no update on breaking news. The Kindle blogs on news are all lacking as well, though the Reuters and AP options are the best I have found (though they are left leaning as well). the new york times is a must have for the kindle. i read the Times better on Kindle. Less expensive and muchh easier to read at Starbucks than struggling with the entire paper. I love the Times on Kindle! It has made my life better! However, very valuable sections are missing. For example, on Friday's paper the Broadway theatre listing was missing, while the classical and dance sections were there. These weekend activities are an important part of the Times value to subscribers (at least in the NY area) and need to be included. A few more photos would be nice too : the real estate and weddings sections have none. Both of these are cases where a photo adds value to the story. Difficult Format for newspaper subscriptions.